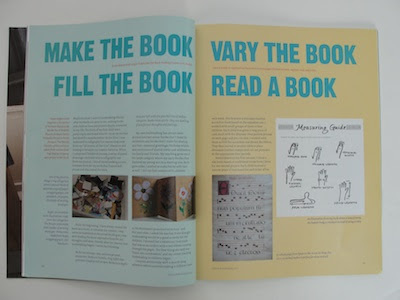 I was so excited to get a copy of Letter Arts Review in the mail yesterday with my article on making books with children that I had to feature it here. 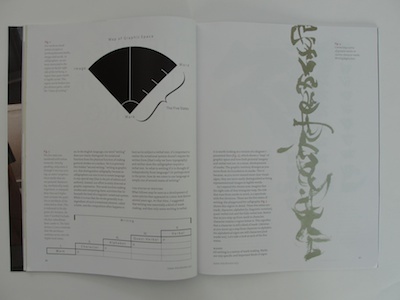 It is beautifully designed by the Editor and Designer Christopher Calderhead who so graciously invited me to send the article and lots of photos for illustrations. I think the best way to represent the magazine is to show you a page and short paragraph of each of the long and in-depth articles. I'll start with a quote from mine which is my personal story of the development of my teaching children in schools. Books have spirit; they are dwelling places for our thoughts and feelings. The restricted space of the seal requires considerable design acumen and precision, but if successful, will embody the Chinese ideal of the seal as 'the world in a square inch'. 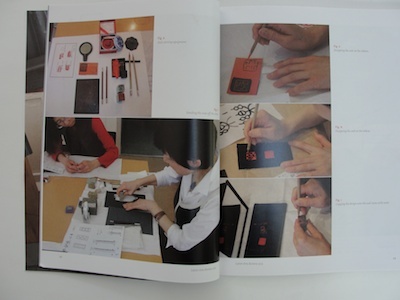 For connoisseurs a seal will provide as much satisfaction as looking at a good piece of calligraphy or ink painting. The problem with the issue of illegibility vs. legibility is that it depends on a false assumption: that writing is inherently linked with language. The falseness of this assumption isn't obvious; we often tend to think of writing as the jotting down, or notating of words. When writing is framed in this way as a linguistic pursuit, the legibility dichotomy emerges with an almost moral force: legibility serves language, illegibility snuffs it, and therefore calligraphy that is illegible is less than legitimate. But the linguistic link hides a deeper and more fundamental connection: writing as a gestural, graphic activity. It is writing's graphic role, rather than its role as a linguistic notation, that opens new vistas for us visual artists. But recognition is not the goal for Wissam. 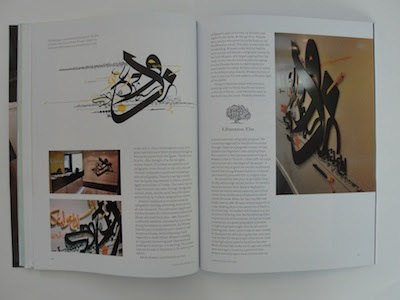 As he says of himself, he started as a calligrapher and arrived as an artist. As calligraphers we too need to recognize ourselves as artists and continue to press on in the evolution of our art form. He is very wary of using the term "craft" in this discussion. Craft is all to often used to belittle the art of lettering, and Wissam sees calligraphy as a fine art no matter what culture it comes from. He feels that all arts—music, sculpture. architecture—are continuing to develop and evolve. The cover artist is Yukimi Annand. 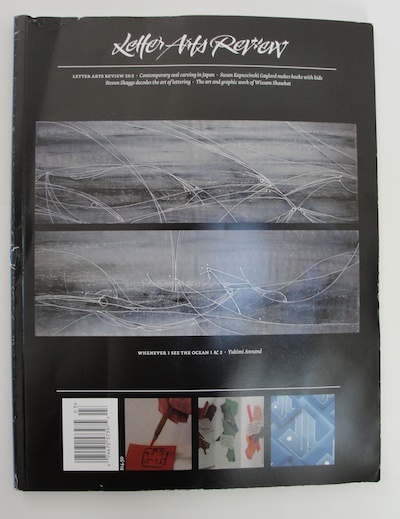 Subscriptions to Letter Arts Review as well as individual issues are available from John Neal Bookseller. Sorry for the late comment, but I just saw this. First, congratulations on the article in LAR. I'm so glad you posted about it! But, mainly I HAD to tell you that the poem/quote you included that you wrote years ago is absolutely inspired! Once in a great while you come across a writing so unique, so articulate, so full of truth that it resonates far beyond the usual even well loved writings. This is one of those pieces. I was amazed at how each statement was validated by another insightful thought stated as evidence of the original idea. It's one of those writings that is so true that it leaves one in awe for someone having thought it while at the same time thinking I feel the same way, why didn't I think to say it that way?! If that makes any sense. I have always adored books and your writing speaks exactly as I feel about them. Thanks for sharing this and for your generous spirit with which you so readily share your fantastic book making ideas. I teach art to kids at a youth center for at-risk kids and I have used your tutorials time and again and the kids feel such a sense of accomplishment after making their books. Thank you! Thanks SO much for your kind words. On rare occasions the right words just come and that was one of them. I may have done a little tinkering after I first wrote it out but not much. What a great publication! It really broadens one's perspective. Congratulations on your article and thanks for 'sampling' some of the other articles for us. I was unaware of this journal until now and would love to read more so will have to check it out further. Susan, congratulations on your published article! That is awesome! You are a true inspiration for many-keep up the great work. I loved this article. It was very uplifting and I will try to remember all your advice while playing/bookmaking with my grandchildren. I have this issue so don't enter me into the drawing. Visiting your blog is like dipping into a well of creativity, and the bucket always comes up with something I need, though I may not have known it! I think the last line of your poem(? )about books is going to go over the door of my library. Now I will know how to start to respond when my students tell me that they don't need to read books. I am so glad I stumbled upon your blog! At times I feel as though I am the only person left on earth that just enjoys holding a book in my hands while reading (especially with all of the e-readers around). Congratulations on the published article! Thanks for your generosity and enthiusiasm, Susan. I am making books with young people in Australia and you are a constant inspiration.